One of the best parts of Disney World is meeting the characters but with so many to see, it can be tricky trying to fit all your favorites in to your day. 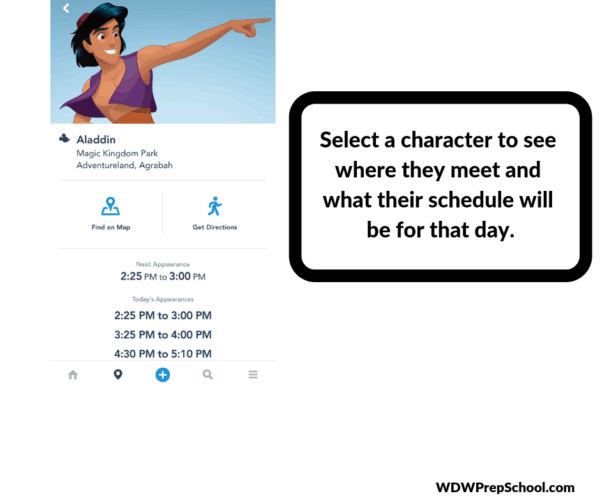 Luckily the My Disney Experience App lists out most of the characters, making it easy to see who, where, and when the characters are meeting in the parks. This may seem like a no brainer but you have no idea how many people never even download the app. Once you do, open it up. Sometimes it can be a bit...slow...to open, but don't give up. When you open up the app you'll notice a menu across the top: Filter (top left), Wait Times (middle) and Show List (top right). 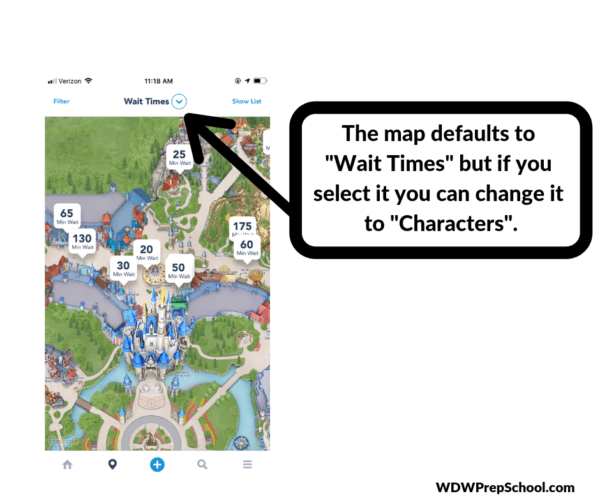 The map defaults to "Wait Times" but if you select it you are able to change it to a bunch of different things, like Attractions, Dining, Entertainment, Restrooms, Characters (plus more!). 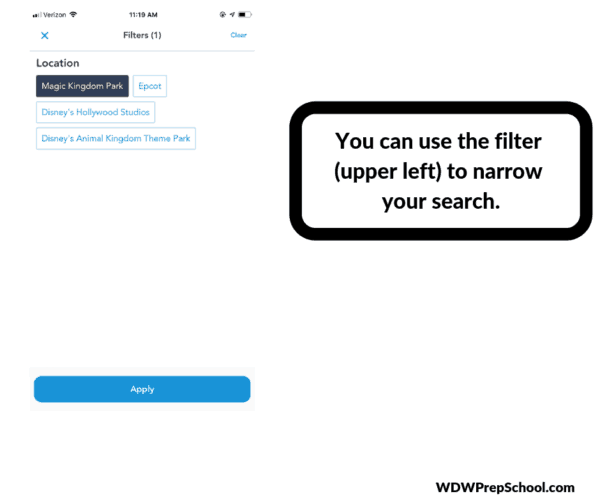 The "Filter" lets you narrow your search. 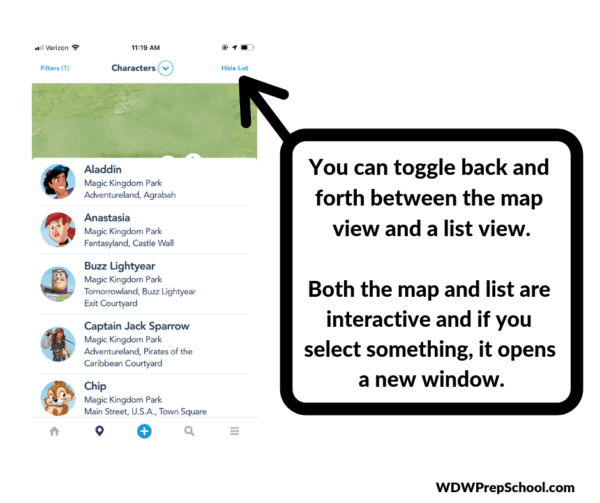 The "List" in the upper right lets you toggle back and forth between the map view and a list view of the characters at Disney World. Both the map and the lists are interactive and if you select something, it will open up in a new window. When looking at a detail view for a character you'll see the list of appearances left for the day, plus it will plot it out on the map for you and even give you directions for how to get there from your current location. 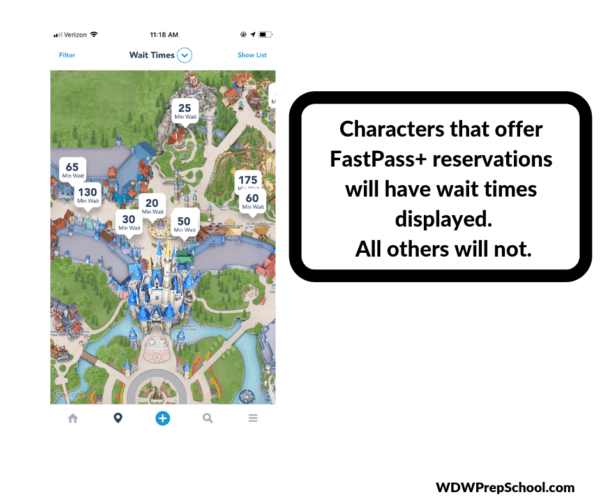 Characters that offer FastPass+ reservations will have wait times displayed, but the others will not. 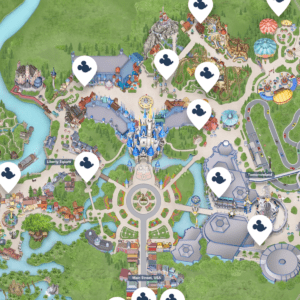 Remember, you don't have to wait until you get to Disney World to play around with the My Disney Experience app. In fact, we highly recommend that you don't. 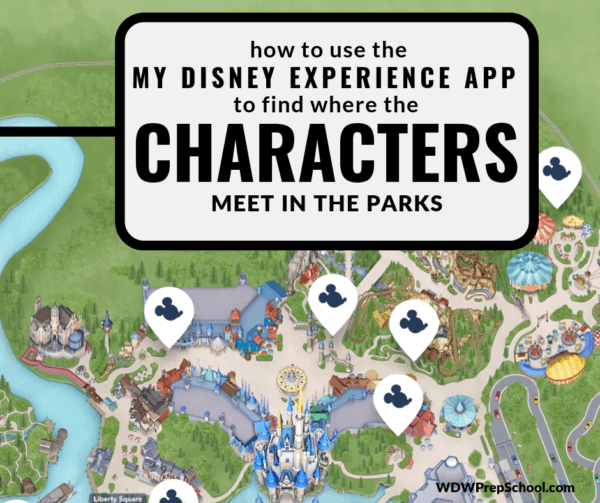 Instead, download it ahead of time and spend some time exploring it and testing it out so that you don't have to waste precious park time fumbling through it when you're ready to look for your favorite characters at Disney World.